Newcomers to stargazing might think an expensive telescope is required — but all you need is a good pair of binoculars for many of the sky’s great attractions. 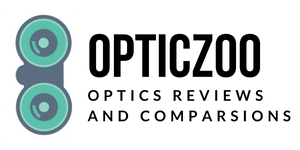 You can always spend more for premium quality, but there are ways to find high optical performance without emptying your wallet, too. 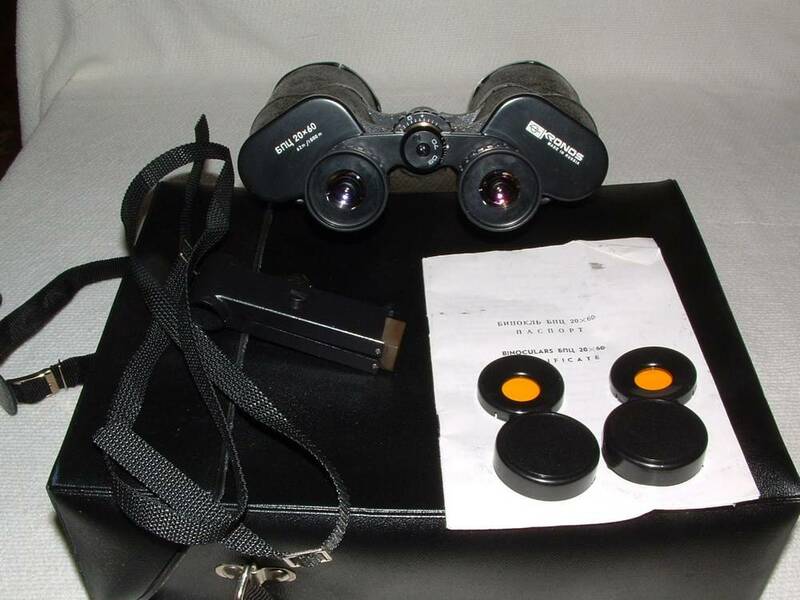 Some enthusiasts turn to older binoculars as an affordable alternative. After all, they have a proven design of high optical quality. 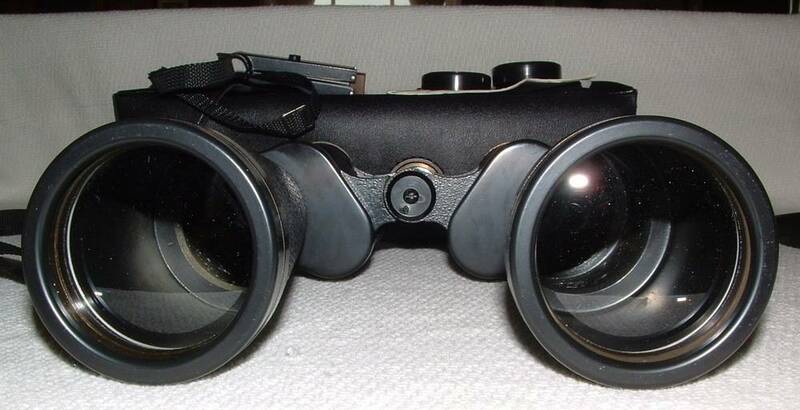 In this article, we’ll review one of these vintage binoculars, the Russian-made Kronos 20×60. We’ll explain the pros and cons of these formerly prized high-grade instruments, and what to watch for when trying them out. 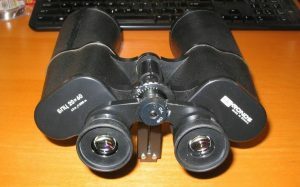 Kronos are Soviet-era binoculars produced for military use. They were high quality for their time — better than most optical instruments then being made by Western manufacturers. 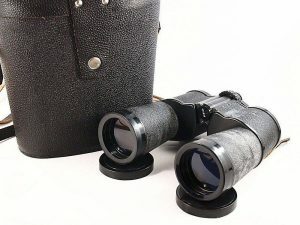 These vintage binos even compare well with current high-quality models. Budget-conscious enthusiasts seek out these older bins as a way to obtain high optical performance — and a piece of history for a good price. Aficionados who collect Soviet-era military gear add to the demand, so the market for the Kronos has gradually tightened. More than one size of Kronos is available. The lower magnifications are excellent field glasses, but stargazers tend to prefer the 20×60 for celestial power. 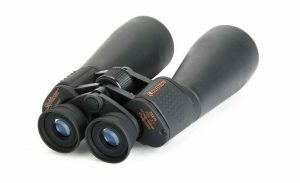 The qualities of Kronos binoculars derive from their military origins. They aren’t the most elegant of instruments, but are definitely rugged and durable. 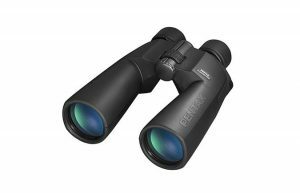 When in good condition, Kronos bins provide a sharp image with accurate colors, and operate at a wider focal range than most current binoculars at equal magnification. They focus and hold a setting easily, and are comfortable over long sessions of viewing. The crisp, pinpoint view of a well-preserved set of Kronos is equal to an expensive premium pair of binoculars today. With these oldies-but-goodies, you can clearly see the rings of Saturn and the moons of Jupiter. The center area of the view is sharp with only slight distortion on the edges. The main issue when purchasing Kronos binoculars is the collimation, or “tuning,” of the lenses. If the collimation is out of whack you may see double images. This is a complicated adjustment to make, so be sure you see a correct image before buying … or at least know what your getting into. The Kronos uses BAK4 prisms with strong, high quality glass. This strength is one reason they’ve lasted so long. There is little field curvature or other distortion, and it renders colors faithfully. The field of view (FOV) is nicely wide for this level of magnification. The binoculars show sharp detail across the entire FOV, and their precision-aligned optics show strong depth perception even at distance. There is a known issue of a yellow tint over the FOV that is common to all Kronos bins. The problem increases in brighter light. For astronomy purposes this might not matter, but you might consider this issue if you’re looking for a high-powered birding bino for daytime use. Many users get used to the hue, but be aware this is a factor. Harking to military demands, the Kronos has an exceptionally short range of focus, especially for the magnification capacity. You can focus from about 25 yards (23m), or adjust for viewing miles away. With these bins, you can enjoy a detailed view of a small bird 100 feet away, and smoothly change focus to watch deer grazing on a hillside miles away. The focus mechanism is traditionally center-mounted. It’s a bit rough, in keeping with the crude exterior casing, but it adjusts to exact measurements. Focus doesn’t slip easily, either: you can focus these binos and hand them to a comrade, who will be able to see the same image immediately. For all their clumsy, crude looks, Kronos binoculars are surprisingly comfortable to use. You can spend hours viewing without strain or discomfort when using a mount. These binos were ergonomic before it was a thing. The ocular element uses a “Floating Eyepiece Design” that makes focusing easy. You can’t use them with spectacles—but you can use the focus to correct for mild myopia. Graceful is not a military specification, so these Kronos have seldom been mistaken for opera glasses. The porro prism is housed within heavy, bolted-on construction. It looks its part as quality, clunky, retro gear. The exterior is metal with a roughened texture, which some consider is more comfortable and secure than modern rubber coatings. It is also more bomb-proof than most. Weight would be an issue if you didn’t use a mount: but you should plan on using one. At this magnification, your arm will soon shake too much for satisfactory handheld viewing. Tentos are another Russian-made bin from back in the day. They are held in slightly higher regard than the Kronos, though the optical difference won’t be detectable by casual enthusiasts. The Tentos have the same issues as the Kronos, including a yellow-hued cast in daylight and complex collimation. The Tentos are great for anyone considering the Kronos, and for the same budgetary reasons. Though Tentos usually carry a higher price, the market does fluctuate. 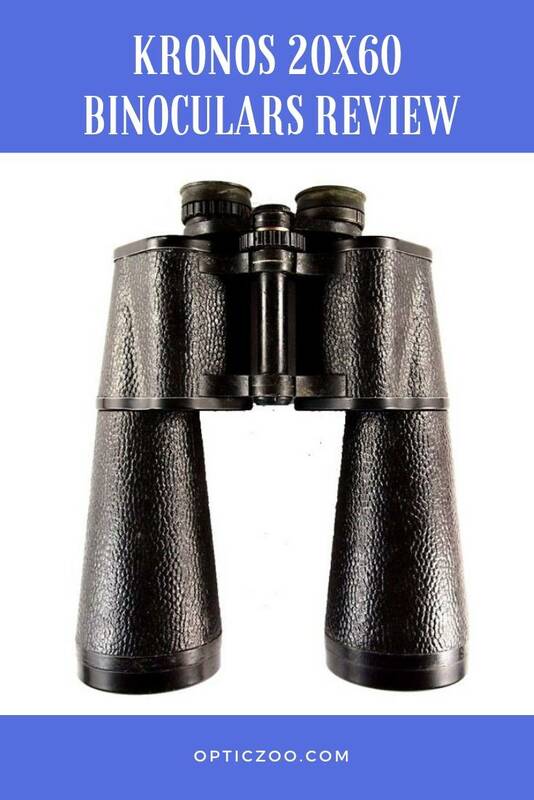 Both binoculars have rugged construction and fine craftsmanship. Check them out … they are interesting historical items, too. Pentax are affordable modern binos that surpass the 5-decade old technology of the Kronos, but only slightly. The optics are similar, and they share excellent clarity and color rendition. 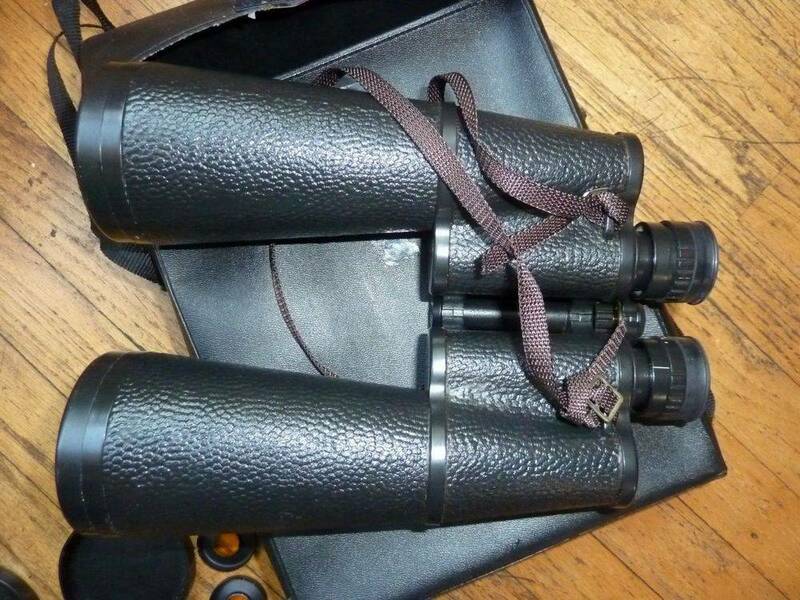 They are a good alternative to consider if you’re looking for a newer but still affordable quality pair of astronomy binoculars. The main complaint about the Pentax 20×60 is their narrow field of vision–one noticeably smaller than the Kronos. Some find the over-sized objectives on the Pentax awkward to handle. The Pentax does have the advantage of being newly made, even though you’ll probably spend less on the Kronos. 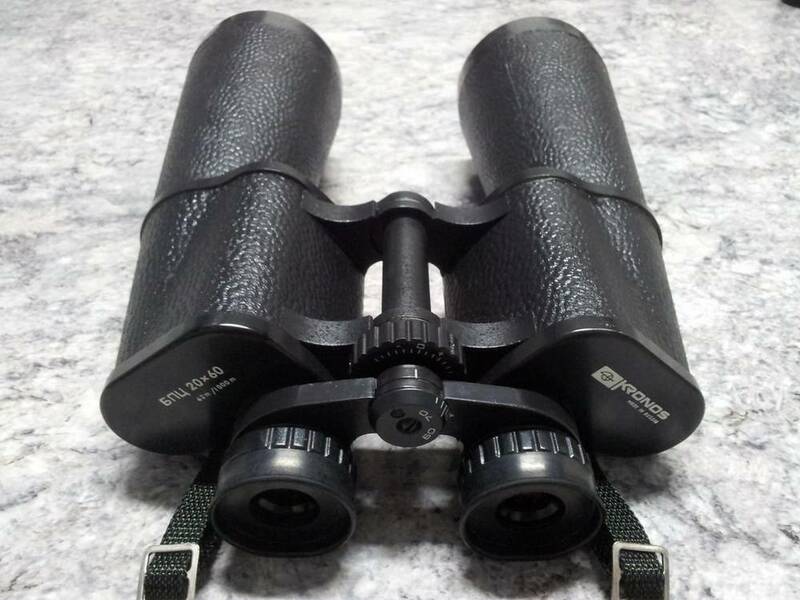 This popular mass-market binocular has 25x magnification and solid if not remarkable optics. The Celestron has launched many stargazing careers, producing high-value binoculars that aren’t as good as the best, but which don’t cost as much, either, and still do a good job. The clarity is fairly crisp and the image is bright. The Celestron is basically a knock-off of the performance seen in a Kronos, and uses modern shortcuts to replace the skilled and careful labor of yesteryear. Coatings have improved over time, but precision alignment has not. Some prefer the original. 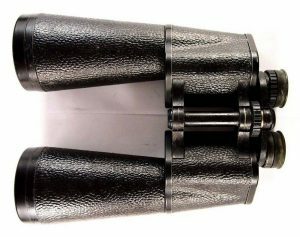 Russian binoculars still endure because they offer excellent optics, superior handling, durability, and comfort. The FOV is sizeable for this magnification, so you can more easily find targets and take in a wider view. Because of its high level of optical quality and bargain price, enthusiasts still hold on to these older but hardly bettered instruments. If you decide to try out a pair, be careful of battered merchandise. If these bins are out of collimation, be sure you are ready to have it repaired or do it yourself. Take reasonable care and you could luck into a fantastic bargain. Check them out for yourself … happy bargain hunting!